Whether you are a hobbyist or a professional, one of the most important machines you can have in your tool box is a band saw, especially if you like to work with metal, wood or plastic. When most people picture band saws, they think of big bulky machines that sit in a corner of a shop gathering dust until something needs to be cut. They are not usually portable, let alone simple to operate. If you are looking for a band saw that fits this description and more, look no further than the DeWalt DWM120K. The DeWalt DWM120K is one of the best band saws on the market right now, and is always ranked in the top ten in its class. It is powered by a 10-amp motor that spins at between 100 and 350 spm, just enough speed to ensure the saw cuts cleanly and easily, and that it does not jam or slow down while it is doing so. The saw has a speed control knob that allows you to fine-tune the revolutions per minute depending on the task at hand. 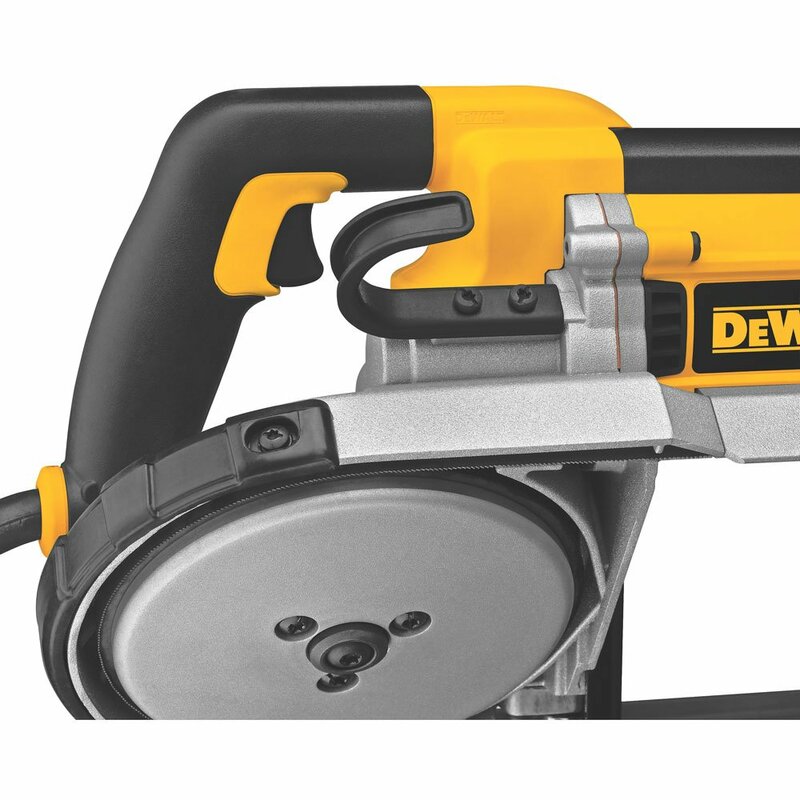 The DeWalt DWM120K is able to make 5 inch cuts through almost anything round and 5 by 4.75 inch cuts through rectangular stock. This includes all sorts of metal, wood and plastic, and it is especially good at cutting through thick stock. Some users have even noted the fact that it cuts through metal much faster than it does wood and plastic. 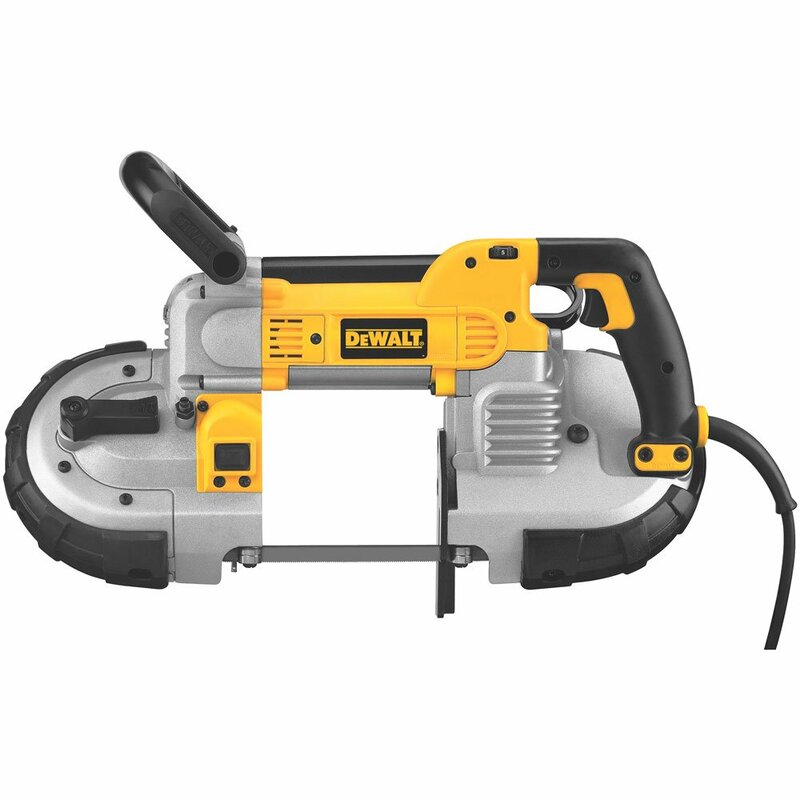 DeWalt have a rich history of supplying the masses with the best quality equipment you can find, and this saw is no different. Its ergonomic design features, such as the soft back handle and the mobile front handle, not only allow the user to hold the saw comfortably, but they also help to increase the life of the blade. Those features, coupled with the hanging hook and the steel surface and rubber protectors help to keep the blade sharper for longer, reducing maintenance costs. The DW120K also has a blade support system that helps to keep the blade straight and in line by adjusting its position automatically using dual-bearing glide rollers. This Band Saw has proven on more than one occasion that it is tough enough to handle any jobsite. When the blade finally does need to get replaced, it is easily accessible thanks to a handy lever that relieves the stress on the blade. Also helping to preserve the blade is the side mounted LED light. 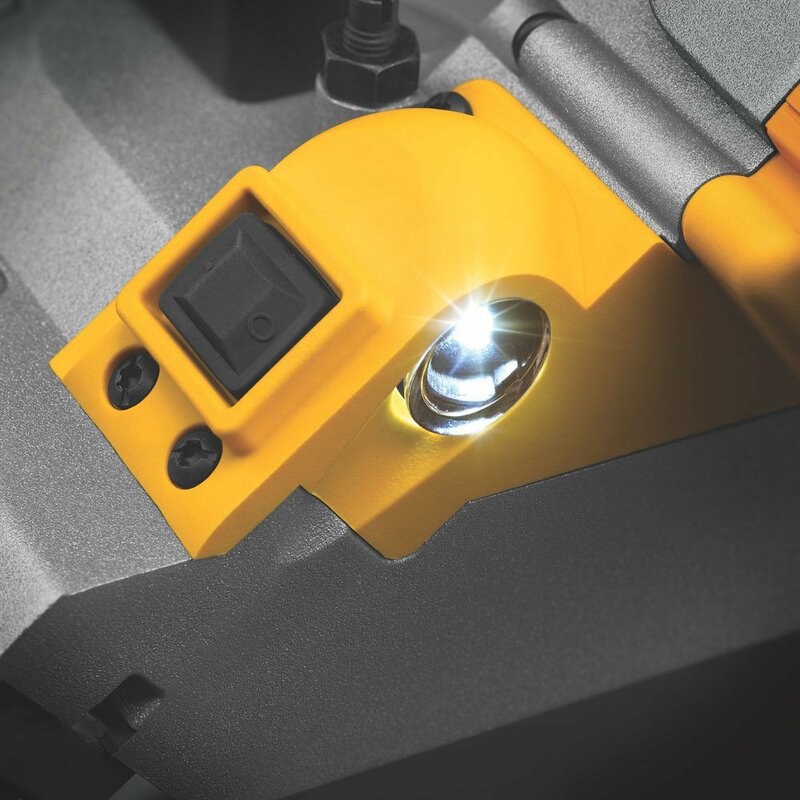 This light is meant to help the DWM120K operator work in almost all conditions, including the dark, by helping the operator to find the cut line regardless of the amount of light in the area. This also helps preserve the blade by allowing the user to use the machine properly. Should there be any fault with the machine you are covered with a limited 3-year warranty, as well as one-year free service and a 90-day money back guarantee. The DeWalt DWM120K may be one of the top rated band saws in the country right now, but that does not mean that it is an infallible item. For starters, the plastic case is not as durable as one would hope, and there are many users who complain about how easy they are to damage. One particular user was furious at the fact that the case did not even last two weeks and it was already refusing to close. Some customers (who made online purchases) even complained that the box did not arrive altogether, and that they have now been forced to look for alternatives such as cardboard boxes. Another item that seems to mysteriously disappear from the shipping box is the stand that is promised when you place your order from a site like Amazon.com. Some users are not even aware that they are supposed to get a stand with the saw, while most just see it as a delivery error. Another complaint has been the build quality on a few of the units. Despite the fact that these are DeWalt products, there are still people who have come forward and complained about different things failing. The most common failures are in the rubber bands around the drive wheels, which keep slipping off, and the bolts on the drive pulleys, which keep falling off as well. There have also been complaints about the hanging hook, which many people say could be more durable. Many users have complained that the screw threads on the DWM120K are not strong enough to hold the weight. Others have complained about how easy it is to dislodge some of the other screws. However, the largest issue with the DWM120K was the stock saw blade. DeWalt may be known for some of the best equipment in the world, but they do not make the sharpest blades, something many users found out when they purchased the product. If you would like to use this saw immediately, it is recommended that you buy the extra blades and replace the stock blade before you begin work. The DeWalt DEM120K has gained respect from the DIY and professional worlds for a good reason; it is just that good. The LED is perfectly placed to provide the best light, and the variable speed motor ensures that no project is beyond reach. This is a tool that should make a great investment to your expanding toolbox.